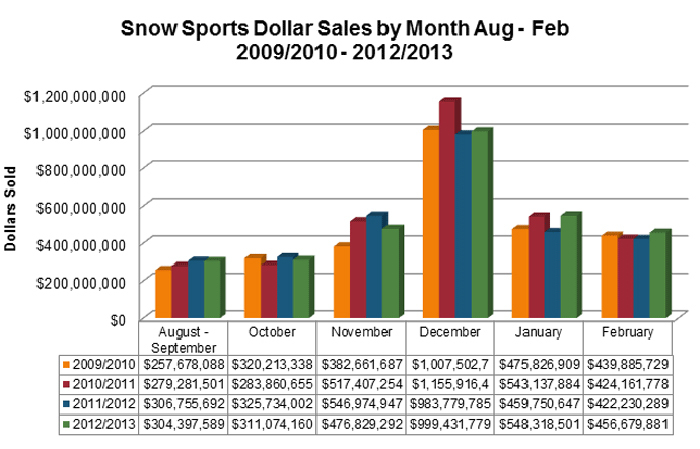 Washington, DC -- SnowSports Industries America (SIA) and Leisure Trends Group have released SIA RetailTRAK™ numbers for August - February 2012/2013. Total market projections are based on data collected from the point of sale systems of more than 1,200 snow sports retailers. Through February this season, snow sports retail sales reached $3.1B, up 2 percent when compared with dollars sold from August to February last season. Retailers struggled to make up for slow sales in December due to the late start of the season’s snowfall. Although sales in January and February are healthy compared with the past four seasons, it has not been sufficient to make up for relatively lackluster sales earlier in the season. Specialty shops have sold through $1.7B in snow sports equipment, apparel and accessories and continue to be the widest distribution channel in the snow sports market. Sales in specialty shops are 1 percent lower or $18M less compared to Aug – February sales last season. The second widest channel is the Internet; consumers have spent $737M online for snow sports gear this season, about $68M more than they did August–February last season. Chain store sales are about even with last season’s sales at $694M. More than half (55 percent) of the dollar sales in chain are for apparel, 36 percent are for accessories like hats and gloves, and just 8 percent were spent on equipment. Through all distribution channels, snow sports equipment sales are down slightly in units sold, and down 2% in dollars sold to $750M through February. Alpine ski equipment brought in more than 60 percent of all equipment dollars and sales were down 2 percent in dollars, including sales of carryover alpine ski equipment. Snowboard equipment sales brought in $232M through February—down 8 percent compared to sales in the same time frame last season. Cross country ski equipment sales finally increased 2 percent to $15M as the snow fell. The shining star of equipment categories this season is Alpine Touring with a 21 percent increase in dollars sold to $15M. Snow sports apparel continues to have the most dollar share at snow sports retail, bringing in more than $1.3B through February this season. Apparel sales are up 2 percent in dollars sold and up 3 percent in units sold, led by a 4 percent increase in sales of insulated tops. Sales of snowboard bottoms are up 8 percent and alpine bottoms sales are up just under 1 percent in units sold. Sales of equipment and apparel accessories increased 3 percent in dollars sold to $1B through February. Accessories that are needed on mountain and on trail, including hats, gloves, baselayer, goggles and camera equipment, enjoyed increased sales this season. Twin tip ski sales (flat and systems combined) are up 2 percent in dollars sold to $70M and up 4 percent in units sold to 169,000 pairs of skis sold through February 28. Sales of alpine/AT boots, alpine boots with a walk mode and rubber/Vibram sole designed for use with alpine touring bindings, have more than doubled compared to last season. Through February, 67,000 alpine/AT boots were sold at snow sports retail shops. Sales of lighter, more technical AT/Randonee boots are up 44 percent in units and 60 percent in dollars sold. Sales of skins, used on the bottoms of skis to prevent backwards sliding when traversing or sliding uphill, are up 12 percent in units sold and 11 percent in dollars sold. Splitboard sales, although still a small category with 3,100 units sold through February, are up 14 percent in units sold and up 7 percent in dollars sold. Action camera sales are soaring, up 14 percent in units to 95,000, and up 37 percent in dollars sold to $29M. A late start to snowfall that depressed sales in November and December most likely prevented a palpable rebound in snow sports retail sales this season. However, sales during January and February were strong as snow finally fell and consumers returned to the slopes and trails. The cynicism that dominated the early season market after a dismal 2011/2012 season has dissipated. The mindset of the consumer heading into next season should be far more optimistic and therefore willing to spend. The market data presented in this report comes from the Snow Sports RetailTRAK™ produced for SIA by Leisure Trends Group. Leisure Trends Group gathers RetailTRAK™ data directly from the Point of Sale systems of more than 1,200 snow sports retailers. For more information about snow sports retail sales, market data and other SIA Research products including the Snow Sports Market Intelligence Report, the SIA State of the Industry Videos, Snow Sports Participation Study and other exclusive industry reports, please contact Kelly Davis, SIA’s Director of Research at KDavis@snowsports.org or visit snowsports.org/research. SIA releases the topline results for snow sports retail seven times each season from November to May covering results of retail sales made between August 1 and March 31 each season. Topline/category retail sales data for the snow sports market is available as a member benefit to all SIA members. In addition, members gain free access to topline data for the Running, Outdoor and Paddle Sports when you register. The topline data is accessible on a 24/7/365 basis on Leisure Trends Cross-Industry RetailTRAK™ data portal. Non-SIA members may subscribe to the topline portal for just $375 per year.